I am using a small 720 mAh LiPo cel. 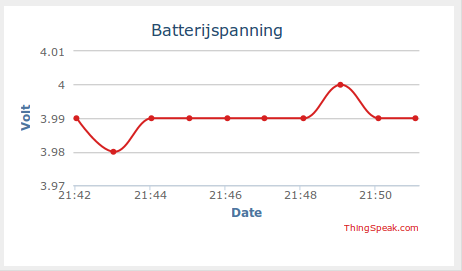 If I just leave the Wemos access the internet continuously it will last 6.5 hours, but for this example I will put the Wemos in Deepsleep for a minute, then read the battery voltage and upload that to Thingspeak. First, connect RST with GPIO16 (that is D0 on the Wemos D1 mini). This is needed to let the chip awake from sleep. Then connect the Vbat through a 100k resistor to A0. So why a 100 k resistor? By adding a 100k , it will in fact be a total resistance of 100k+220k+100k=420k. 1 Volt is the max input to the ADC and will give a Raw reading of 1023. Ofcourse you could also do that in one step, but I like to keep it easy to follow. However, rather than a 100k resistor, a 130k resistor was used. The voltage divider thus becomes 100/(130+220+100), so for a full reading of 1023 (=1Volt on A0) a total of (1/100k)*(130+220+100)=4.5Volt would be necessary. In reality the Lipo cell will not give off 4.5Volt. Depending of course on what your project is required to do, my advice would be to put the thing in the deepest possible sleep once it hits the low end of the battery voltage, maybe only to sound a piezo buzzer for say 200 ms when it shortly wakes up. That will be the safest bet to keep your LiPo alive as long as possible. The cell shown probably has a low voltage protection circuit build in though. Still, the warning is helpful. Sidenote: The other day I accidentally miswired a cell like that (600 mA version), reversed polarity. In a few ms, the magic smoke appeared and the cell seemed to have lost quite a bit of it’s capacity. Hard to believe things going south that fast. Turned out the protection circuit had fried a bit. Without it, the cell runs fine with 550 mAh betweem 3.0 and 4.2 volt. I agree. It is quite easy to do that. My intention ofcourse is that it will not get too low because of a solar cell that is to provide enough input. esp.deepsleep is as far as i know the deepest sleep, but when the battery voltage hits 3.0 it might be wise to let the deepsleep last as long as possible and do no uploads anymore. I am not sure at what voltage the esp stops working, but it does still work at 3Volt, and will proceed to discharge the cell. as you seem to direct this to Jeroen, I am not sure what sketch you refer to? From “the guy with the Swiss accent” I understood there is a setting that the ADC on the ESP8266 reports Vcc without any external components. Might save two resistors and a few uA. I think the episode where he experimented with a Li-Ion button cell. Are you sure? AFAIK it reports the Vvv on the bare ESP module (so shoud be 3.3-ish). Now I know you want the battery voltage, and after boosting and then dropping to 3.3, all is lost. This is IMHO very usable if you hook up an ESP to a Lipo with just a good LDO. Agreed about “the guy”!! my mistake. I mean the VCC on the esp indeed. Needless to state the battery shield is not a good low power option at all. i added the 100k resistor like explained above, but there is some deviation between the readings from the esp8266 and by manually checking the voltage with the multimeter. In my setup a 18650 battery with 3000mAh is used, powering a wemos d1 mini with dht22-shield and battery shield. The 18650 had a voltage of 3.53V when i measured with the multimeter, the reading from A0 was 3.24V. Currently i am charging, at 4.09V (Multimeter) A0 reports 3.88V. So there is some inaccuracy betwen 0.21V and 0.27V. While i could “fix” that via adding an offset, i’m interested in the reason behind this. I put a 100K from the 3.3v pin to A0 and I am getting within .05v. That can be easily adjusted in the program. There will always be slight variations. Could you please tel me what is the name of the connector from the lithium Battery? Hi, I see that Wemos has new battery shield V1.2 where is possible to connect resistor 130K to A0 via jumper 2 (J2). How the calculation will be looks like if we will have 1.3V not 1V in this case? In the diagram of the board wiring, the resistor shown is Brown – Black – Red = 1k, not 100k (Brown – Black – Yellow). Has anyone got any tips for calibrating the ADC values against the battery capacity? I have a WeMos D1 mini. I’m not convinced its genuine but it seems to work fine. I measured across A0 and GND with two separate multimeters and got a reading of 314K and 316k respectively, so somewhat short of the intended 320k voltage divider (unless there is another path to ground via the ADC itself even when the wemos is powered off in which case that could lower the resistance value, right?). I don’t know how to work out the value for each of R1 and R2 without identifying exactly which tiny SMD resistors they are and trying to scratch away at the lacquer than may be coating the exposed contacts. With an added 100k resistor between A0 and the battery positive terminal (carbon film, actually reads at 97k on the multimeters) and an 18650 LiPo battery as a power supply for the WeMos, charged to 4.16V I get a reading of 917 on the ADC. This seems quite low, even if I play around with the numbers for R1 and R2 quite significantly. I just wondered if anyone has a good way to baseline the ADC so that I can make the battery monitor as precise as possible. I’m not looking for exacting +/- 0.01V accuracy or anything, just a way to tune the readings I get to be as accurate as possible. There are several ways to do that and I think you may be making it yourself a bit unnecessarily difficult. For one you could just measure r1 between A0 and ADC and see what r2 gives you by measuring between ADC and mass. R1 should give you an accurate reading and the r2 reading might be influenced by the gate itself, but I presume if you switch off the Wemos it should be pretty accurate. Another way is to use a known voltage and apply that to the A0. Now the ADC reads a max of 1 Volt, so, if your resistors were correct, applying 3.2Volt, should put 1 Volt on the ADC and your reading should be 1023. If it isnt, you can calculate the ratio of the resistors, but it would be simpler to just use a correction factor in your software. As you seem mainly interested in measuring the battery, obviously you would need an extra series resistor and you can play around with that value, or use a correction factor again in your software. 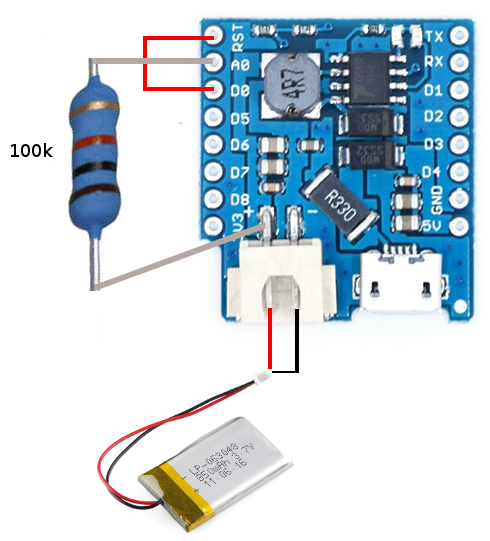 Be sure though that you are not measuring more than 1 Volt on your ADC, it will not immediately destroy your Wemos, but it will clip the top value readings. You can calculate r1 and r2 from that by substitution. This ofcourse all under the premises that the readings you gave were correct. You may make it even easier by just using r1 and r2 and put a voltage of 3Volt on it and see what reading you then get. That way you eliminate the 97k from the equation. So I managed to solder a piece of wire to the ADC pin of the ESP-12E chip. It seemed that just touching it with the multimeter lead yielded no reading. I guess there is some sort of flux/lacquer covering the contacts to prevent oxidisation. This is still a long way above the ADC value of 917 that I get when I construct the circuit and flash the WeMos with my code. I’m glad i’ve got to the bottom of the discrepancy. I hope this explanation of my analysis and calculations may prove useful to others. Does anyone have any thoughts on why my ADC seems to hold 1.1V as it’s reference voltage instead of 1.0? But do you mean that when you put 1.1V on yr adc you get a reading of 1023 and when you put 1 volt on it you get a lesser reading? Until your comment, no I hadn’t applied 1.0V directly to the ADC pin; that was worked out by reading ADC values of higher voltages through the voltage divider (after I had measured more precisely the resistor readings of R1 and R2). Since then I have applied 1.0V directly to the ADC pin and it gives me a reading of 980. When I apply 1.1V the reading goes off the scale, but when I apply 1.077V I get the max reading of 1023. The ESP8266’s ADC is massively uncalibrated. 1024 is “about” 1V, but the calibration is pretty different per chip. A good practice, assuming you really need this, is to store the calibration in EEPROM. It also unfortunately means that you cannot build a big bunch of hardware where you reply on a calibrated ADC. It’s a nasty omission. Would a BC457 transistor be fine to switch the voltage monitor on/off? It would have been great if you could provide a scheme for that setting, too. Thank you for this awesome blog entry! Yes it would, but depending on circumstances maybe a Logic level FET would be better as that I think has a lower voltage drop than a regular transistor. But in fact I have used a BC547 to Switch off voltage to Soil-moisture probe (voltage less of an issue there). I used your code, but found a mistake in it. I used a Nodemcu v3 Lol1n board, the 3.3 V power supply give 1010 ADC Value for me. So I must calculate the correct value to measure correct voltage. For 1010 ADC Value the correct number is 3.34685598. Hi there .. great project .. Would you mind explainging how to do this with a ‘barebones’ ESP8266 12F ..AiThinker type ? You do that in the same way but you need to construct your own voltage divider as the esp8266-12 does not have one. Voltage divider needs to bring 4.2volt down to 1 volt. The latest official Wemos Battery Shield (v1.2.0) has a jumper connection J2 connecting (+) to A0 via 130kOhm resistor. https://wiki.wemos.cc/products:d1_mini_shields:battery_shield No need to solder the resistor on your own, just shorten J2. 130kOhm is strange, though. The calculation needs to be adjusted. Previous Previous post: So your touch sensor is not working?